From the track to your living room, there’s never a dull moment when you bet on Horse Racing with us. And with our Racing Weekender you can enjoy the best of both worlds. This amazing offer is available every week! Simply place your qualifying bets from 00:00 UK Time on Monday to 23:59 UK Time on Thursday to receive your Free Bet Bonus for the weekend, added to your account instantly. 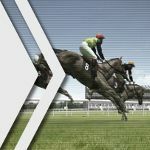 -for a Guaranteed £5 Free Bet on Horse Racing for the weekend’s races (Friday, Saturday and Sunday). Offer only applies to real money Online and Mobile Ladbrokes customers aged 18+ whose accounts are registered in the UK & Republic of Ireland. The promotion runs from 00:00 UK Time Monday to 23:59 UK Time Thursday every week until further notice. To participate, customers must place a bet of £10 or more in one bet during the qualifying period each week at odds of EVS (2.0) or greater on Virtual Horse Racing. Upon qualification players will be awarded a £5 Free Bet to use on Horse Racing over the weekend (Friday, Saturday and Sunday each week). Bets on any on-demand virtual sports market will not count towards this offer. Qualifying bets exclude Forecasts and Tricasts. Free bets will be credited automatically on the settlement of the qualifying bet. The free bet credited will be available to use on real Horse Racing only. Customers with Euros (€) accounts are paid in a Euro value equivalent to GBP (£).